1. 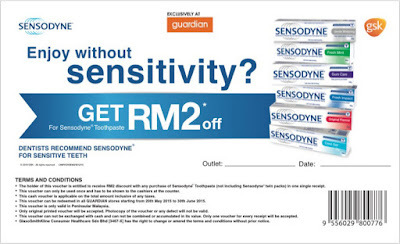 The holder of this voucher is entitled to receive RM2 discount with any purchase of Sensodyne Toothpaste (not including Sensodyne twin packs) in one single receipt. 2. This voucher can only be used once and has to be shown to the cashiers at the counter. 3. This cash voucher is applicable on the total amount inclusive of any taxes. 4. 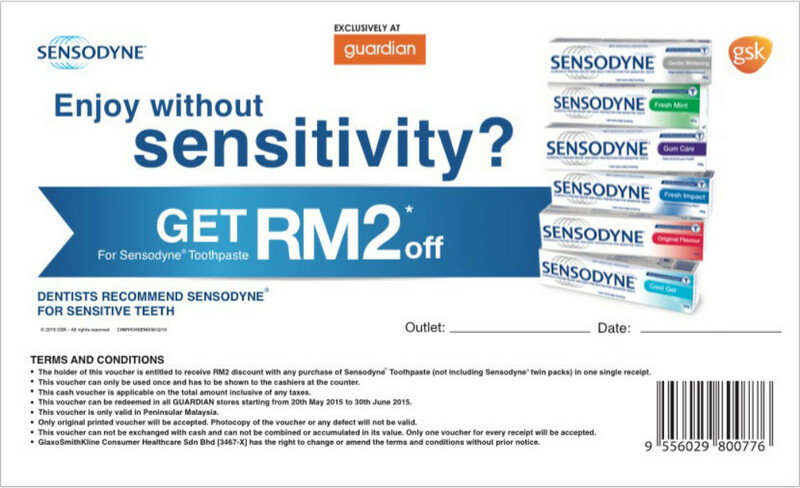 This voucher can be redeemed in all GUARDIAN stores starting from 20th May 2015 to 30th June 2015. 5. 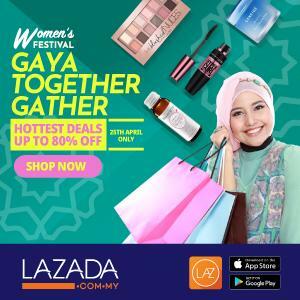 This voucher is only valid in Peninsular Malaysia. 6. Only original printed voucher will be accepted. Photocopy of the voucher or any defect will not be valid. 7. This voucher can not be exchanged with cash and can not be combined or accumulated in its value. Only one voucher for every receipt will be accepted. 8. GlaxoSmithKline Consumer Healthcare Sdn Bhd [3467-X] has the right to change or amend the terms and conditions without prior notice.